Cut the cauliflower florets into corn-kernel-sized pieces. In a large frying pan over medium heat, warm 1 to 2 tablespoons oil until hot but not smoking. Add the cauliflower, season with salt and pepper, and cook, stirring occasionally, until tender, 5 to 7 minutes. Remove from the heat, stir in the fried shallots, if using, and keep warm. While the cauliflower cooks, make the orange-jicama salad. Using a sharp knife or a peeler, remove the peel from the jicama; cut the white flesh into ½-inch-thick slices, then into ½-inch pieces. Using your hands or a sharp knife, peel the orange; cut the fruit in half lengthwise, then into ½-inch pieces. Discard any seeds. Zest the lime and juice half for the salad; cut half into wedges for garnish. In a medium bowl, stir together the jicama, orange, scallions, mint, cilantro, lime zest and juice, and 1 to 2 tablespoons oil. Season to taste with salt and pepper. Pat the salmon dry with a paper towel; season generously with salt and pepper. In a medium frying pan over medium-high heat, warm 1 tablespoon oil until hot but not smoking. Add the salmon, skin side down, and cook until the skin is browned and crisp, 4 to 5 minutes. Turn and cook until the flesh is opaque and flaky, 2 to 4 minutes, depending on thickness. Transfer the salmon and the cauliflower “couscous” to individual plates. Top with the orange-jicama salad, sprinkle with the sumac, and serve with the lime wedges. Jicama is one of our favorite but least known foods. The Central American root vegetable has a mildly sweet, nutty flavor and is surprisingly juicy. 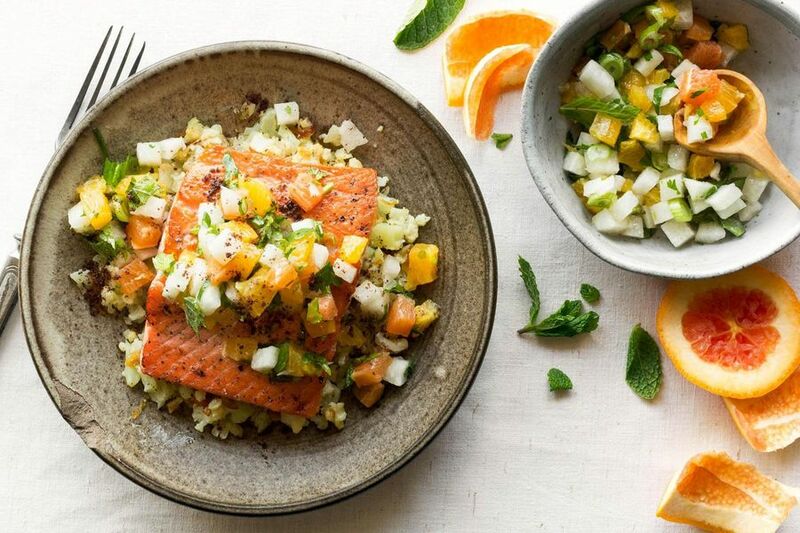 Here, Chef Justine pairs it with oranges and tangy sumac for a lively counterpoint to salmon. For a crisp salmon skin, pat the fillets as dry as you can before searing, and get the pan nice and hot before adding the fish. Calories: 560, Protein: 41 g, Fiber: 10 g, Total Fat: 31 g, Monounsaturated Fat: 20 g, Polyunsaturated Fat: 5.5 g, Saturated Fat: 5 g, Cholesterol: 75 mg, Sodium: 370 mg, Carbohydrates: 28 g, Added Sugar: 0 g.